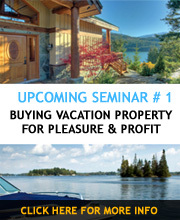 Are you interested in buying recreational property in the near future? For example, a cottage, cabin, or chalet – maybe own it outright, or jointly buy the property with family, relatives or friends? Maybe you want to buy an apartment or townhouse condo in a resort or recreational community – and own it outright, or own a ¼ or 1/10 share in it with others? Maybe you already own recreational property? Possibly the property has already been passed down through various family generations? Whatever scenario above best describes your current circumstance or wishes, there are tax implications when it comes time to sell, transfer, or bequeath your recreational property. If you have not yet bought a property, you have some tax planning advantages. Here is an overview of the types of tax issues and strategies to consider. As in any tax planning, you need to get customized advice for your own situation from professionally qualified accountants with tax expertise. You also want to have the coordinated advice from a skilled estate planning lawyer to avoid future potential conflict in the family. As tax, legal, and estate planning issues are frequently intertwined, planning needs to be strategically integrated. This article is simply intended to stimulate awareness, and motivate you to do some prudent tax and estate planning, by giving general guidelines. There is no capital gains tax on disposition of a principal residence. Up until 1982, a couple could own two properties, eg the home primarily lived in, and a recreational property for example, and each designate one of the properties as his or her principal residence, and therefore sell or transfer both properties tax-free. The federal government changed the tax laws as of 1982, so there can only be one principal residence for tax purposes. However, let’s say that you do not have any children, or your children do not want to use your vacation property as they own their own second properties, or live too far away geographically. In this situation, passing the vacation property down through the generations is not an option. You wish to sell it for your retirement, lifestyle, or financial needs. Maybe due to health reasons, you do not use the property much anymore, or it is becoming too costly to maintain. You could still have some tax saving options available. Depending on your circumstances you might be able to designate one of your two properties as your principal residence for tax purposes. For example, if you owned a Whistler, B.C., chalet that had appreciated $2 million over 15 years, that originally cost you $500,000, that would be a $1.5 million capital gain. If the residence you lived in primarily was located in Chilliwack, B.C., that cost you $100,000 five years ago, and is now worth $300,000, that would be a $200,000 capital gain. If you deemed or designated your Whistler property as your principal residence for tax purposes when it was sold in 2006, you would not have to pay capital gains tax. What about your Chilliwack property in this scenario? When it was sold, you would calculate the portion of the time you held the property prior to the sale of the Whistler property, eg five years, and add one year. Then calculate the total number of years before you sold the Chilliwack property. For example, if you sold the Chilliwack property in 2016 and therefore had held it for 15 years in total, the portion of capital gains that you would need to declare would be 5 years + 1 = 6 over 15 years, or 6/15th of the capital gains on sale. If it sold for a $500,000 gain, you would need to declare a gain of approximately $200,000, and pay tax on 50% of that gain, eg $100,000. Depending on your personal taxable income and marginal tax rates in that taxation year, and based on tax advice, you might have to pay up to $50,000 for the property sale. You see, you still might be able to have your cake and eat it too!